Gumsu Benyero Fadil is the second daughter of the late former head of State and Commander – in – Chief of the Armed Forces, General Sani Abacha. She studied interior design and creative art from the University of Jordan. She is married to Cameroon born billionaire and replica of Aliko Dangote in that francophone country in the person of Alhaji Fadil Bayero, who is also one of the leading politicians and philanthropist in Cameroon. 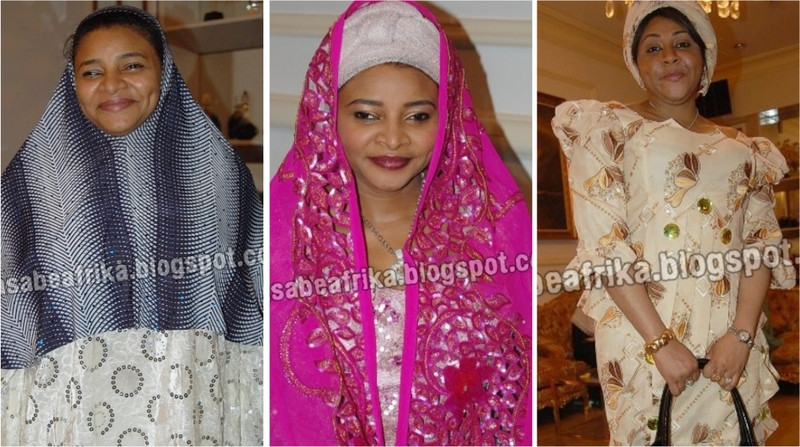 Gumsu who has four loving kids for her billionaire husband spoke to Asabeafrika sometimes ago inside her father’s multi-billion naira Kano-Northern Nigeria mansion and this is what she said to us about herself. Enjoy. Q: You are one of General Sani Abacha’s daughters who have really taken the pain to learn the chemistry of marriage well; Can you tell us more about the ups and down of the marriage institution? A: Of course there are lots of challenges; we are all human beings, we have our ups and downs. Marriage in most cases, especially in this part of the world is about you, your husband, your-in-laws, and your family. Even among your siblings, it is a big challenge and the best thing is just to be patient and to always think before you act. I think that has been very useful to me and it has helped me in the running of my home. Q: You noticed that a lot of marriages break this day in Africa and particularly Nigeria. Before it used to be much in the West- Europe, America Et al. But today spouses in Nigeria call it off after just few months of the union. Do you think it is as a result of our Western exposure or simply lack of wisdom to manage the challenges of that institution? A: Well, I won’t blame it on wisdom or western exposure; I think it all goes down to the husband and the wife. It is either incompatibility or other big challenges. Like I said marriage is one hell of a big challenge. Our own parent went through it and it will really interest you to know the kind of diplomacy they adopted in making a family to bring us up. My special advice to women is to be very, very, very patient. A woman must be very respectful of her husband. She has to respect him in order to have peace in the home. That has been my strategy and I must confess it has really helped me. It has helped me a lot. Q. How did you start life in Cameroon, leaving Nigeria some years ago with your husband to begin a new life in Cameroon? A: life is life. Life is okay, life is good. My life is my husband and my children so I am happy, and my husband has been so good to me. We have four lovely children and that is it. Q: Don’t you think it is a rarity for you to be married to a rich Muslim like Alhaji Fadil Bayero and yet you remain his only wife? A: Well, I think it all goes down to what I said earlier on marriage and couples; it has to do with compatibility and dialogue. Once you have dialogue and compatibility, the issue of having a second or third or fourth wife won’t even arise. If you can handle your husband, if you can handle your home, I think you should be able to take it through. Most couples that have hitches in their marriage life, you find the man taking two, three, four wives. At the end of the day, there must definitely be something wrong somewhere either with the wife or with the husband himself. But unfortunately the blame always falls on the woman, that is mostly unfair, you know. The men also have their faults most of the time. Well, it is a man’s world. But essentially, the woman must work hard enough to ensure compatibility reign in their union. Q: Looking at the lifestyle of your father and mother, you see one family that never gave room for infiltration. Is there any lesson you can say you have learnt from your parent’s life style? A: Of course, my mummy is my role model; she brought us up very well, very straight. She taught us to be good, to be respectful and she even used to force us to go into the kitchen before we got married. She did that to us at a very young age, which is very important. I am trying to do that with my children right now. Yes, of course they had their ups and downs in their own time too, but at least, they stick together. So, I believe marriage is not just a contract, you know. After a while, you become your brother’s keeper, your husband’s keeper and then your husband becomes your keeper. And you must also look at the children all the time. Your kids are your future. They are your life. You want to bring them up, you want to give them the best education; and that enough should concern us. We must endeavor to be focused on building our home and building our children for a greater future. Q: You will agree with me that most marriages of children of the rich and famous, which you fall into, break before we blink our eyes. In your own case will you say the kitchen diplomacy your mum taught you made the difference? A: A lot of men appreciate their wives’ cooking skills. A lot of men like it when their wives go into the kitchen and cook, and they are satisfied with it. A lot of it again, has to do with ego. Probably because the girl is from a more successful home than her husband, she want to boss around. But you can’t have two captains in a ship. You always must have one captain and the captain is your husband. You must follow what he has to say or what he does. You have to be loyal to him; you don’t have a choice if you want to make it work. I have done that and I will continue to do that. Q: Can you tell me about your lovely kids? A: The first-born is Sultana Maryam. The second is Ibrahim, and the third is Abubakar. The last one is called Fadila Zainab. A: Well, I am always awake very early in the morning, take care of the kids and ensure they prepare for school. I make sure they are well dressed, brush their teeth, and say their prayers; have their breakfast. Most times, I walk them to the car and I say good-bye. And most time when they return from School I hear when the car hoots at the gate and I come out to say ‘welcome’. Q: That is a sign of a great mum. You mean you are a full time housewife? A: Yes, I am a hundred percent housewife. Q: And how does life look like being one because most Nigerian women also believe life doesn’t look real good with being a full time house wife? A: Well, I am happy to be a housewife. My kids are enough challenge for me to handle. They are my special project. They give me a good reason for being what I am and to me it is a good way of life. I am happy. Q: What is your fashion sense like? A: Fashion is every woman’s delight. I like to wear good things; I don’t care about name or designer, or the price tag or whatever. As long as it is nice and I like it, I wear it. It doesn’t have to be picked in Paris, London or America. It could even be in Sabon Gari (In Kano) or anywhere. Fashion is what suits you; it has nothing to do with being extravagant. Q: Tell me the choicest gift your husband ever gave you? A: You mean the one I cherished. A: Quite a lot, wristwatches, handbags, bangles, and Diamond ring. But you know the most important gift I cherish? It is his love; because it is his love that brings out everything in him and in us. So it is his love actually that is the most cherished gift. Q: As the daughter of former Head of State and Commander – in – Chief of the Armed Forces and now the wife of a billionaire magnate, you must have visited the best of tourist countries in your life time, which one is your favorite holiday destination? Q: What do you like in Paris? A: It is like my second home now; I have learnt to speak French a little bit so I have to go by. I like Paris a lot. A: It is my mum. She is great, smart and a passionate homemaker. Q: Do you have any message for women and mothers? A: I just hope women will stand together, be strong, and fight it. We are women of course and men have always suppressed us all our lives. But I think with the new changes, the millennium development goals and everything, I think and I hope that women will get to greater heights. We can see that happening already in Nigeria and around the world and I know there is still much to come. Q: What is your favorite television channel? Q: Do you have a favorite sport? A: Football, Paris Saint German is my favorite football club. It is a Paris football team. A: My husband is a politician, a philanthropist, and he is a businessman as well. He tries to do his best at the level he finds himself. He gives to the needy, the poor. He contributes to the Chantal Biya Foundation (The Cameroon’s first lady Foundation). He has contributed a lot to that. He is doing well so far. Q: We learnt he is also interested in leading the country as next President of Cameroon? A: I don’t want to talk about it. But hopefully soon, when it happens I will invite you. You will surely come to cover it. You will come, you will come. Zainab Abacha is the first daughter of the late Head of state and commander- in- Chief of the Armed forces, General Sani Abacha, a very beautiful and daring lady. She is a first degree holder in law from Birmingham University, England. Zainab is equally a master degree holder in International Relations from University of Abuja, Gwagwalada. She is presently doing her PhD. Programme in far away Dubai, United Arab Emirate. She once suffered a bad marriage with her late father’s minister of industry, Basheer Dalhatu. The union produced one issue – Sultan. However Zainab shared the story of her life with Asabeafrika during the wedding of her younger sister, Rakiya sometimes ago in Kano. Enjoy! Q: How is Zainab abacha looking at Rakiya’s marriage to Sadiq? Q: Can you tell us more about the wushe-wushe ceremony which you participated along with Rakiya early in the day? A: That is part of the traditional rites; it’s all parts of the bridal initiation she needs to do before being given out to her husband. The wushe –wushe as you have seen is done with the elderly women and veterans in order to have all the blessings in her marriage. I think most tribes in our country have their own way of wishing their brides success in marriage. This wushe-wushe is our own traditional initiation of the new bride into womanhood. Q: Why have you kept low profile? A: I have been around. I have been in the country most of the time. Q: Is it true you are now doing a PhD. Programme in a higher institution? A: Well, I am studying. I am studying. I won’t say more than that. Q: At your first degree you read law at the University of Birmingham, England, followed with Masters in International Relations from University of Abuja, what gave you the audacity to follow up with a PhD? A: Well, no knowledge is lost. Knowledge is enormous; in our life time one can not but try to seek new ideas and knowledge at all times. I think it is one of the challenges we must live with—seeking knowledge. It is a worthy cause, I fell I need to go and advance my knowledge. Education is life. It is one very important moral tool you need to sail across the challenges of life. For me it is a worthwhile experience to go back to school. It is a worthy venture and I am enjoying it. Q: Do you like politics? A: We humans are political by nature just as we will say most African men are polygamous by nature. I don’t see anything wrong in politics so far it is been fairly practiced. The problem with our country is that we don’t see politics as a toll of allocating values and wealth to the general public; instead we see politics as a means to end our own problems. That is not the ultimate goal of politics. And that has been the bane of social development in under developing countries. In advanced countries, politics is seen as a tool for change. You saw the Obama fever in America; you can see and feel the political permutations of Angel Merkel in Germany. This is to show you that politics is not a cheat maim or rig game. It is for change. I like politics, but I rather play at the advisory level for now. Q: Sources have it that you are now in a new romance, how true? A: That is personal. Honestly I don’t discuss my personal life in public medium. With due respect, I don’t find that interesting. Q: But marriage is an important factor in a woman’s life, are you not considering taking a shot at it again? A: That is personal. It is still a personal opinion weather I want to marry or not. It is personal. Q: I hope you are familiar with Oprah Winfrey; she is one of world’s richest black women. She is rich and happy, yet without a marriage, not even a child. Is Zainab looking at such a life style? A: That is relative, different strokes for different folks. People sees things differently, everybody’s ideology is different. Something might work for you but not work for others. Everybody’s experience is different. Everybody’s goals and aspiration is different. For me, marriage is the right thing really. It is the most honourable thing for a woman. And I feel a woman is complete when she is married but that doesn’t mean she is less of a woman if she isn’t married. But every woman’s pride and joy is to be married and to have a successful marriage most especially. Q: As someone who has been in it a while ago, what has marriage taught you? A: Maturity and patience. Marriage has taught me maturity, patience and actually to be able to accommodate all sorts. It gives you capacity; a large capacity to be able to absolve many things that you will ordinarily never think would be possible. Q: Are you a cantankerous person. Many fell as the first daughter of the late Head of State and Commander-in-Chief, General Sani Abacha, you must be strong willed and highhanded. How true is this? A: In life, people are bound to perceive you differently. Being afar in most cases makes them see wrongs in you. But in honest submission, I think I am a simple person. People that are close to me know I am very simple. I don’t think I am a hard person; I am a human being; so it depends on the situation. Sometime of course you could react very differently, it depends on the situation. We don’t have the same emotion as human being. It depends. It depends. Q: Do you find anything unique about the life style of your Dad and Mum. They seemed to have taken to each other so much that they didn’t break the bond for so long. Do you learn anything from their relationship? A: They were lucky and it worked out for them. I think that was their luck. Everybody’s destiny is different. Some people have their first marriages last a lifetime and for others, their second marriages are more successful than the first. Everybody is different; you know. Marriage doesn’t really have any script or any blue print. So, you just never know. You just never know, like I said earlier, different strokes for different folks, which is the basis of life. Q: How do you normally start your day? Q: Do you have a favorite meal? A: Yam. I love yam and I also love rice with stew. I can be good with any well cooked meal. Don’t forget I am a complete Nigerian. We lived in major cities of the country with a career soldier Dad. Q: You must have traveled far and wide in terms of holidaying, which country is your favorite tourist destination? Q: Every country has its own beauty; maybe, England. I love England for the quietness that pervades her cities. Q: And what about television channel? Q: How many minutes do you really spend in the bathroom? Q: Tell us a bit of your beauty routine? A: I buy anything I like; anything that catches my fancy I buy irrespective of where I find it. I go for anything that appeals to my appetite. A: No, I don’t look at cost. I go for what suit my taste and it wouldn’t matter how much is the cost, even if it is a kobo. And I can pick my fashion prop anywhere I find them; it doesn’t have to be in one bogus environment. Rakiya Abacha is the last girl of the family. We met her on her wedding night in Kano. Rakiya studied Economics at Bayero University Kano (BUK) her two elder sisters, Zainab and Gumsu are her role models in the area of marriage and family rearing. They were both with Rakiya on her wedding night. But Rakiya who married Kano business man Sadiq Idris Ali, son of late Idrisiyya Motors boss has her own opinion about marriage. She shared her story with Asabeafrika. Enjoy the story of the last Abacha girl. How did all started, I mean how did you meet your husband, Sadiq? We met in school; actually we both attended Bayero University, Kano. And what was the attraction to his person? I won’t say he is not religious, he is religious to the best of his ability but it was his kind nature that endeared him to me, and I think that was the soul of the matter. You know you have always resurfaced in news in the last four years or there about, that you will marry this year and in most cases it nearly came true. Why did it take you so long to marry? It is God’s time that really matters. It is not by man’s making at all it will always be God’s own wish. His family is into transportation. His father is late now. Yeah, his father was a well known transporter in his lifetime. His company was called Idrisiyya transportation and he did well in his own time. He is now taking after his dad in that regard. Was there a relationship between your families? Actually we have known each other since we were kids but we didn’t know our parent knew each other. Of course we also knew ourselves from afar at that time until our path now crossed in BUK (Bayero University, Kano) Even in school we were just casual friends, no romance, nothing. We just went our way. So when did the love thing started? Let’s say two years ago. What did you study in Bayero University? Oh, that is interesting so at what time did he toast you? Readers may need to know? I have told you we started dating two years ago and it became a serious relationship that drew the attention and blessing of our parents. Do you care for style? What kind of style, what do you mean? I mean which style attracts your taste, English, traditional or what? I don’t really have a favorite. I like traditional wears, I like English wears, but it also depends on the occasion. The occasion determines my mood of dressing. But I like any good dress that can conveniently sit on my body. Can you tell me what it takes to be the last daughter of General Sani Abacha? It doesn’t take anything than the fact that one is the last daughter. I am like any other normal child. Ours was a family where maximum discipline was the hallmark. I don’t think there was such pampering from my dad. If you know him very well, he was a soldier, he was a strict man, he was someone who expects excellence in all areas of life, yes, I wouldn’t say I wasn’t pampered, as the last daughter, there is the tendency to enjoy occasional pampering but not to the extent of non-conformity with basic family norms. Do you have something to learn from your mum? My mum is my hero, we thank God for her. She is a very strong woman who could surprise one thousand men at a go. We just thank God for her. What are the basic things she taught you? She taught me everything that mattered from childhood. Everything that mothers are supposed to teach their daughters, she taught me everything. For instance, she ensured all of us start going to the Kitchen at age 15 maximum. She didn’t indulge house helps or cooks to do those things for us. She made us do certain things ourselves. I think she is more than what we thought she is. She is a mother-father all rolled into one. Oh, my inah (The affectionate name they call their mother) thank you (laughs). What about dad, what age were you when he died? I wasn’t so young, I was in my early twenties I was actually twenty one when I lost my dad. How did you feel on the day he passed on? I was very devastated. It was something bad, but God is more than everything. Was he close to you? My Dad was close to all his children. He was a father true and true. He loved and cared for what his children do; so, he wasn’t only close to me; he was close to every one of us. May be you were his pet? I was (laughter) so after him, things changed; we started seeing the other side of people, and even life too. My dad’s demise was the only thing we needed to know what people could be at the slightest change of time. But that was a new chapter in our lives and right now we are conversant with that chapter. Can you tell me three things your dad normally tells you once he scolds you? He actually uses to tell us a lot but one I can vividly remember is this “you can’t eat your cake and have it” (laughs). He kept saying that (laughter). He was strict with this statement and the reality has begun to dawn on us right now. He was just this man who could give you love and discipline in equal proportion. If you are smart and good, my dad will give you his best care, but to be dull means you don’t want his friendship. He was a unique father. We miss him. If he were to be alive how do you think your wedding would have been this night? Brighter. He would have dominated my personality and his big friends would have been around. But this is how God wants it, I thank Him. How do you start a normal day? I wake up early if I didn’t sleep late. I take my bath, have breakfast. If I have something to do I do it, if not I watch TV or hang out with my family, that is it. I have seen women say their wedding day is their happiest on earth, is it the same with Rakiya? So, will you tell me that tomorrow is that day you have been waiting for? When tomorrow comes I will give you the right answer. In determining fashion which one comes first between jewelries, wrist watch and shoes! So where do you pick your fashion props, Nigeria, Dubai or France? Anywhere; I don’t mind cost, anywhere I find anything nice. I will buy it even here in Nigeria, even in the crowd market. Your new man, can you tell me the best gift he has ever given you? Me and him, when we were courting? You mean me and my husband? (Laughs) ok, I will tell you, his love. As the daughter of a former head of state and commander-in-Chief of the armed forces, you would have been privileged to travel far and wide, which country fascinates you most? (Thinks a while) I like Paris, I like Germany and I like Jordan. So which is your favorite holiday destination among the three? What has been your most challenging moment in life? I have had some challenging moments in life but I don’t think I want to talk about them at this moment. May be one day, I could write about them in a book, people will get to find out about it. What was your routine like when your dad was head of state? Life was fun of course but you know what? Sometimes it was really, really hard because you can’t go anywhere, anyhow. Sometime they will lock you in the house; no outing, security this bla-bla-bla. So it was like a life with varieties of challenge. But we thank God, we lived through it. So what is life going to be like after marriage; will you like to be a business woman, a house wife or a politician? I will let you know as times goes on. If I can do all I will. But do you think you can merge all? If God permits, He will decide for me. What do you wish your husband? He should continue to be the good person that he is and I pray God guide him in all his affairs, I will continue to pray for him. Lastly, advice our young ladies who are still searching for soul mate and eager to leave the spinsters club? First of all, they shouldn’t see money as everything. Money is not everything. Love should come first. If they have somebody that they love and he loves them back hundred percent, then that is the most important thing. Money can come later. So, first thing to do is to have someone they love and they respect, and they will obey. Tell me where you intend to spend your honey moon? You know fasting is just around the corner. So we probably start it in Saudi Arabia for starters.